Charlie the black lab is in trouble after driving his owner's car into the Pend Oreille River. Owner Mark Ewing had just returned home from picking up a pizza Wednesday evening. As he walked to his home, Charlie jumped into the car through an open window, and apparently knocked the vehicle into gear. "He somehow got the car into neutral," Ewing said. "My car just went boom, down an incline and into the drink." Ewing could only watch as his Chevy Impala sank into the river. No dummy, Charlie jumped out of the window as the car went downhill. "There's nothing weirder than looking at your car cruising down your driveway when you're not in it and seeing your dog jump out and then watching your car go splash," Ewing said. Actually, things got a little weirder when the tow truck driver showed up. Before the driver dove into the water to hook the car up to his truck, he asked Ewing to hold his dentures. "My car's in the drink, I've got dentures in my hand and this guy Keith from Clyde's Towing goes swimming," Ewing noted. 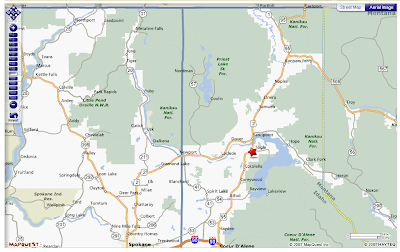 In case you're wondering where Sagle, Idaho is, it's right down the road from Bonners Ferry, home to alert reader Dr Hank. And to that grammar nazi who always corrects my spelling: no, there is no apostrophe in Bonners Ferry, even tho' there was a Bonner. that story seems like it's right out of a stephen king book. ever read cujo? Yep, Sagle is just a 45 minute drive South. Funny, i hadn't heard the news, and news travels fast in these parts. Yes, there was a Mr. Bonner and he owned/operated a ferry crossing the river in the late 1800s. I wanted to start a "Concerned Citizens for a Grammatically Correct Bonner's Ferry" (CCGCBF) or something of the like, but it just didn't take off. ohhhh. Now I get it. I'm always saying, "Where does Hank live?" The explanation and knowing about the missing apostrophe makes it all clear.